Continuing our blog series that explores the UK’s most-loved pedigree cats, this post examines the Sphynx. A cat that catches the eye, the Sphynx is a breed that is renowned for its hairless body and expansive eyes. Beyond the Sphynx’s unique appearance however is a breed this is curious, loving by nature, and is often the centre of attention in whichever environment that they find themselves in. The Sphynx breed initially came about by accident in the 1960’s. A rare genetic mutation resulted in the birth of a hairless kitten called Prune into a Canadian home. This first ‘accident’ was the genesis of the widespread breeding of the Sphynx, which was initially known as the Canadian Hairless Cat. You may be surprised to learn that this breed is now the 6th most popular in the UK. With its’ unique appearance, the Sphynx is often centre of attention and this suits them down to the ground. They are an affectionate and curios by nature and enjoy the companionship of others – be that of an owner or another cat. A Sphynx will often seek out high spaces to explore, or will play with cat toys to keep themselves active and entertained. A Sphynx likes her creature comforts and will find warmer spots on a cold day, so don’t be surprised if they come and curl up in your arms during the harsh winter months! Above all, the Sphynx is an affectionate family cat that enjoys company in whichever form it comes. Like all pedigree cats, regular check-ups at the vets are recommended to ensure that they are in a healthy condition. A common misconception about the Sphynx is that they are completely bald, however, this breed has a thin layer of ‘peach-like’ skin that has small whips of hair. 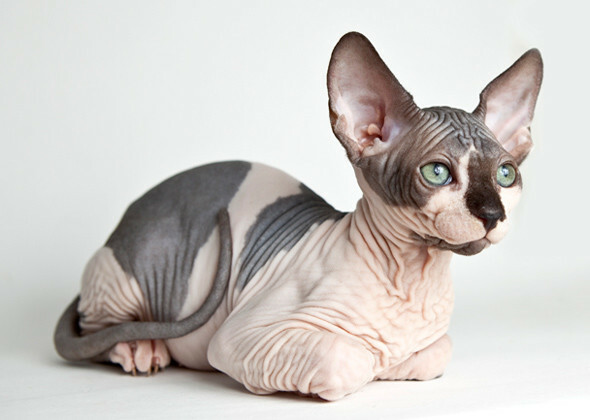 Peculiarly though, the Sphynx doesn’t have any whiskers or eyelashes. It might come as a surprise but the Sphynx requires as much, if not more, grooming than most cats to ensure that their skin is moisturised and well cared for. Using a gentle, scent-free washing lotion in a weekly bath will leave the skin clean and grease-free. Special care needs to be taken in-between any folds of skin to ensure that sores don’t develop. Good dental hygiene is always advised, as is wiping the corners of their eyes every day to get rid of any natural discharge. Remember to use different cleaning cloths for each body part to prevent the spread of infection. 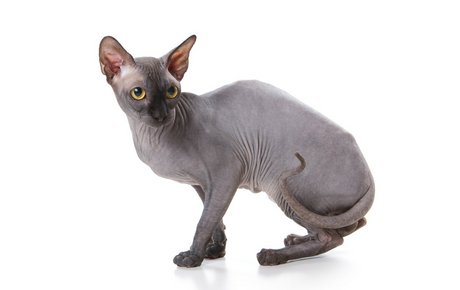 Most Sphynx’s are kept indoors only, but for those that have access to outdoor areas, sun-screen is required on hot days to protect the skin against sunburn. Typically, a Sphynx will live for between 13-15 years. A Sphynx has a higher body temperature than other cats (4 degrees) because they don’t have any fur for insulation. Sphynx’s are sometimes labeled as ‘suede hot water bottles’ as a result! In most cases, the Sphynx is a relatively muscular breed with angular faces that give them an extraterrestrial look. They are born wrinkled, but most of these wrinkles reduce as they grow into adulthood although some of the wrinkles will remain throughout their life. The Sphynx also has large ears when compared with its body size, allowing them to enjoy exceptional hearing. This breed may not not be for everyone, but they certainly leave an impression wherever they go.